My plane landed in Utah at 10:15 and truth be told, I was out on the trails by 12:00. 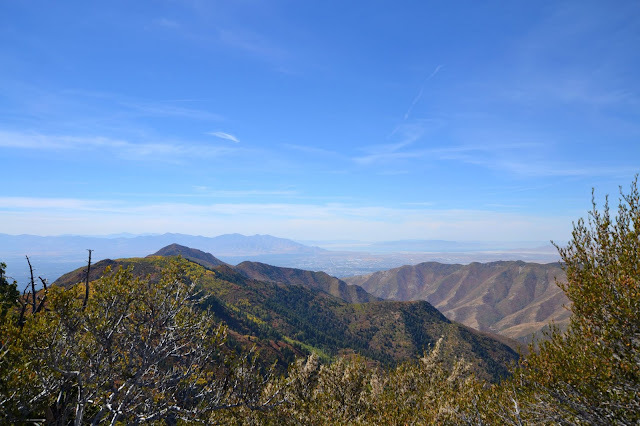 I was itching to be back in the Wasatch, hiking Utah's beautiful mountains at the edge of Salt Lake City. 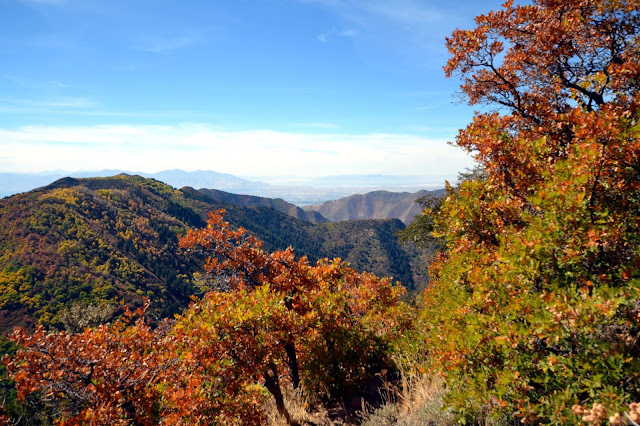 When trying to pick out a hike, I knew I wanted something I hadn't done, something close to the city, a shorter distance (but still a workout), and with some great fall colors and a view. I put out a "call to action" on Instagram and when someone suggested Mt. Aire, I was sold. 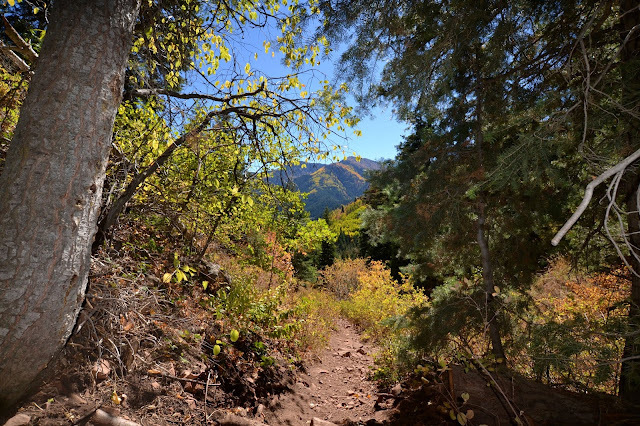 Pretty views, peak, 4 miles round trip, steep and steady, just next door in Utah's Millcreek Canyon. I drove up Millcreek canyon in my loaner Chevy Malibu (I kind of miss it..) passing bikers pedaling their way up the steep and winding canyon road. I drove along blasting my music, soaking in the sunshine, just so happy to be back west. 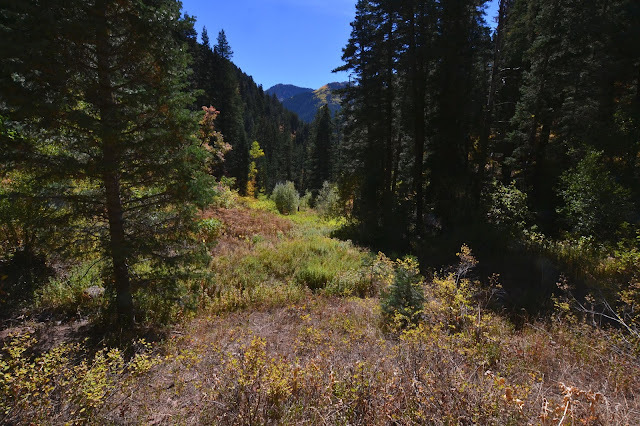 After about six miles, I pulled into the Elbow Fork parking area, loaded up my bag with a few pumpkin beers and water, and headed up the trail. 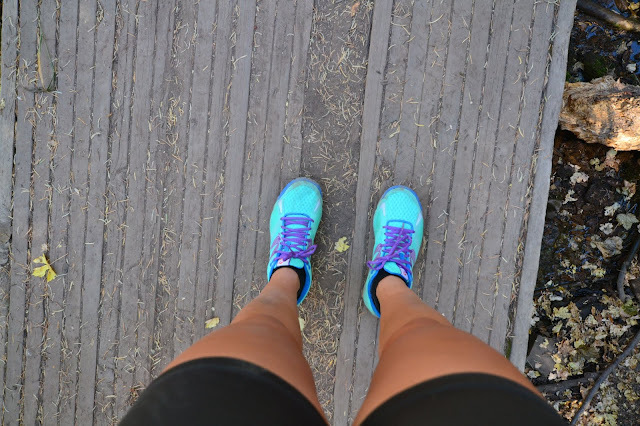 I had just flown in from sea level (I live at about 10') so the higher elevation to start and constant climb as you gain 1,000' of elevation per mile resulted in way more breaks than I am willing to admit on this blog. Fees: $3 a car paid on your way out. 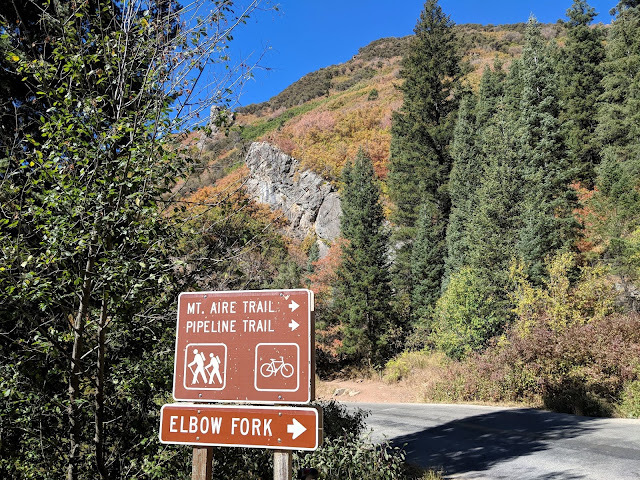 Trail notes: Follow Elbow Fork Trail (you will see signs for Mt. 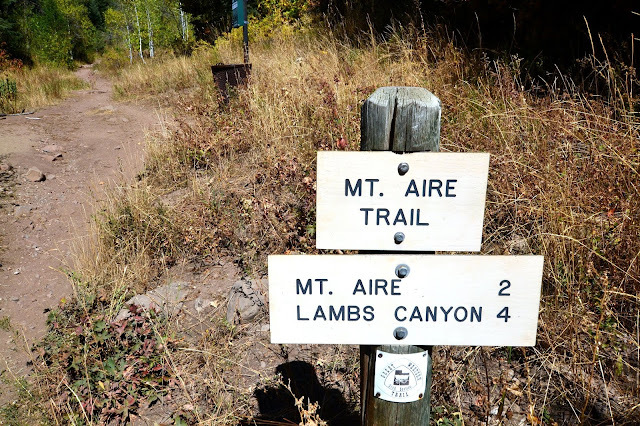 Aire) The trail is steep and mostly exposed, some shaded sections. At your first intersection, follow the trail sign and head left. When you reach the plateau, head right up to Mt. Aire. I hiked this the last weekend of September and the fall colors were gorgeous. Yellow aspens and a pretty shade of reds and oranges mixed in. 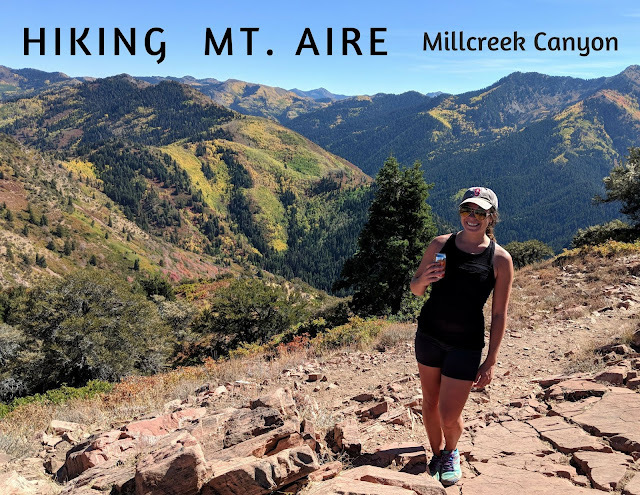 Red Tape: If you complete this hike in the winter, know that from November 1st through July 1st, Millcreek Canyon is closed about 1.25 miles (one way) below the trailhead. 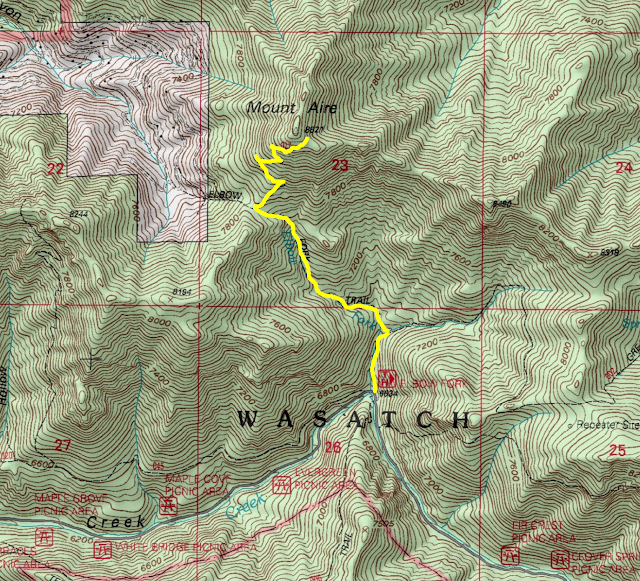 You will have to hike the road which will add 2.5 miles plus elevation to your trip. 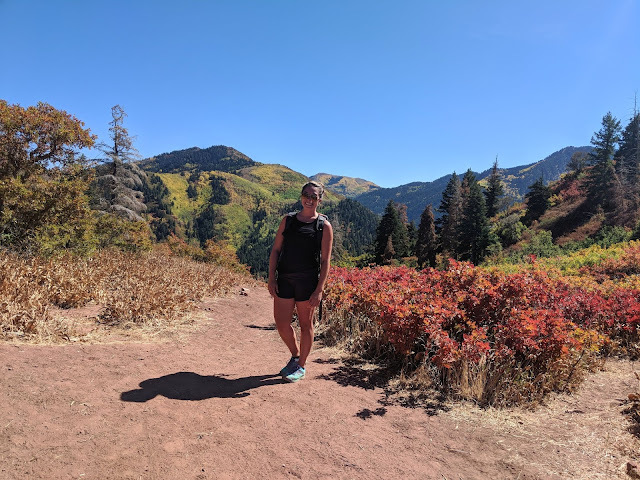 I didn't feel like lugging bike shoes, sneakers, and hiking boots to Utah so I hiked the trail in my running sneakers (or "tennis shoes" to all you Utahns). I wish I had my boots because I definitely lost my footing a few times on the steep sandy and sometimes rocky trail. 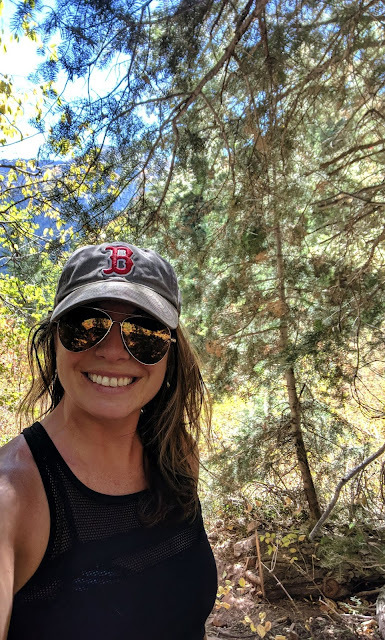 The key to this hike was to stop and look behind you, taking in the gorgeous canyon views as you made your way above the tree line. Oh, and as you caught your breath huffing and puffing up Mt. Aire's steady climb. About half way up the trail, you will reach a sort of plateau where the trail splits in a few directions. I was a little unsure of the trail but luckily I met two women who were out enjoying the beautiful Friday afternoon as well. They informed me the trail went up to the right and I joined their group, chatting and huffing our way up to the summit. 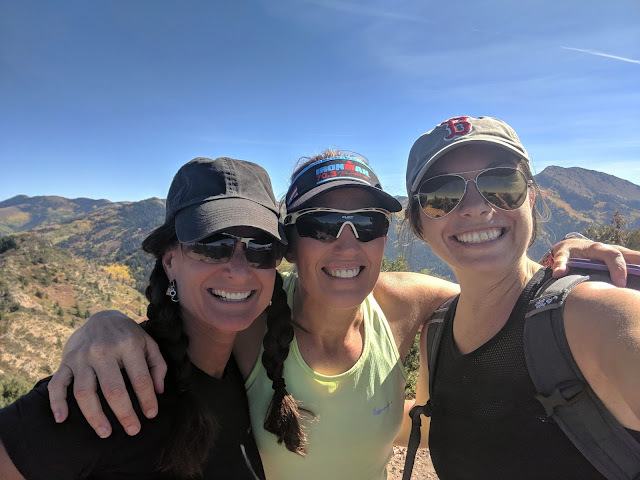 We talked about our favorite hikes, and I was instantly impressed by these badass ladies who had complete 200 mile bike rides, triathlons, and some pretty intense hikes. You truly meet some of the coolest people out on the trail, in the middle of the woods. Rad ladies I met on the trail! The views along the trail, and on my way to the summit were phenomenal. We stopped at the top to take in the 360 views. 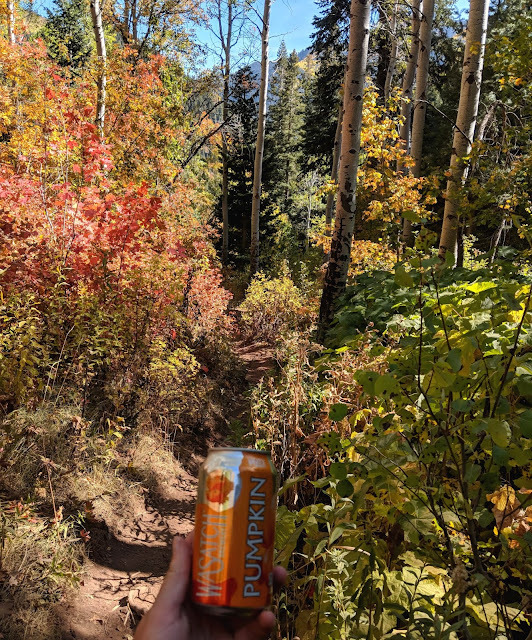 I enjoyed my first pumpkin beer of the season while taking in the fall colors and mountains around me. Looking to the north, you will see Parleys Canyon. Looking to the south the most prominent peak is Gobblers Knob (a famously tough short hike). Baker Pass separates Gobblers Knob and Mount Raymond. 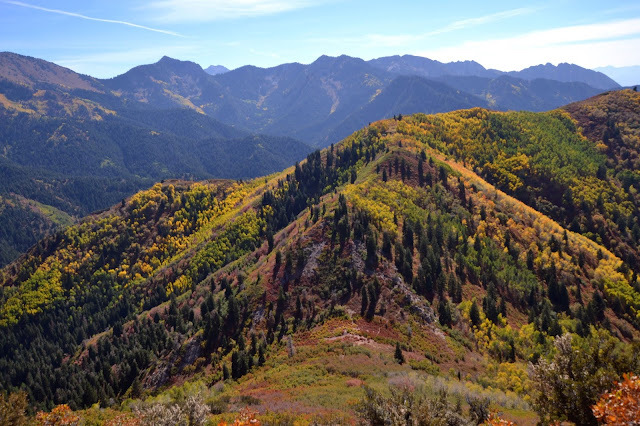 Enjoy the views, take in those gorgeous yellow aspens, and enjoy the sunshine on one of Utah's summits. 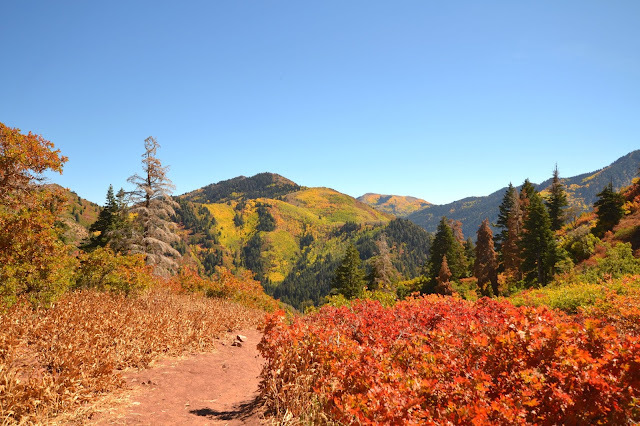 This hike offers great views and amazing fall colors, where you can bag a peak in two miles if you are willing to endure some elevation.